1. Protect Your Plants From Insects: Mix together four onions, two cloves of garlic, two tablespoons of cayenne pepper, and one quart of water. Set this mixture aside and dilute two tablespoons of soap flakes in two gallons of water. Pour your onion mixture into the soapy water, and put it in a spray bottle. Use this environmentally friendly spray to keep insects off of your plants. 2. Clean Your BBQ: To clean grill, heat up your BBQ, then use a fork to hold half of an onion to scrub the grill. 3. Soothe a Bee Sting: If you are ever stung by a bee, grab an onion slice and place it on the stung area. It will instantly ease the pain. 4. Onion smell to prevent fainting: Need something to snap you back to reality? Smell an onion, and the potent odor will bring you back to life. 5. Eliminate New Paint Smell: Place a bowl of freshly cut onion slices in water in the newly painted room. The smell of onions will absorb the smell of paint within a few hours. If you have just painted your cabinets place a cut onion on a dish and put it inside the cabinet to remove the smell. 6. Clean Rusty Knives: Take your knife and stab it into a large onion, repeat few times to remove the rust; Or try scrubbing with a half cut onion. 7. Mosquito Repellent: Ingesting onions or garlic, or rubbing onions on your skin will act as a good bug repellent and keep those insects away from you! 8. Wart Remover: Apply a mixture made up of onion slices, crushed aspirin, and water to your wart. This solution will shrink the wart and soothe it. For best results, place duct tape over the solution. After several hours, remove the tape and reapply if necessary. 9. 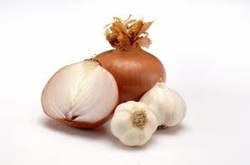 Acne Remover: Onions can also be very instrumental in getting rid of bad pimples! Mix crushed onions slices with water and apply to acne. The components of the onion are harsh on zits and effectively remove them. Strain and drink. Onions have anti-bacterial and anti-viral properties. You will feel better the next day and it helps congestion. 11. For burn relief: A bit of crushed onion mixed with salt can soothe a burn. 12. Onions for health: They have antibiotic qualities, can improve circulation, lower high blood pressure, stabilize blood sugar levels, and decrease the symptoms of colds and coughs. A READERS TIP ADDED: For ASTHMA, EAT ONIONS!!!! Does cut onions & garlic dodge flu???? Onions & garlic are very good if eaten in meals regularly but although people may say they attract bacteria if cut &kept around the house, its not true. Garlic improves the activity of natural killer cells, a type of immune cell that is specifically designed for cold and flu viruses and cancer cells. ONIONS has many uses. Not only do they make our food tasty & healthy, they have many other household uses. Here are some great tips to keep in mind. If cut or bruised, quickly press the cut end of a raw onion on the bruise and keep it there for 15 min. The compound allicin stimulates the lymphatic flow in the blood, & induces healing. Eating plenty of onions will give you good health and bad breath. Eating parsley will help to neutralize onion breath.